Welcome to winding roads, scrubby oaks, and lot's of Gold Rush-era flavor. The northern side of Mariposa County retains a rugged Old West charm that shouldn't be missed by any visitor who likes to find themselves "off the beaten path." The small community of Coulterville (“official” population 115) is a monument to another time. 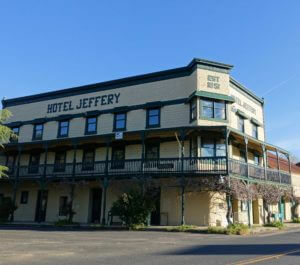 The Hotel Jeffery, built in 1854, has entertained the likes of John Muir and President Theodore Roosevelt, and is now ready to entertain you, either in the historic bar (worth a look, even if you don’t order a drink), the dining room, or the delightful back yard and patio. 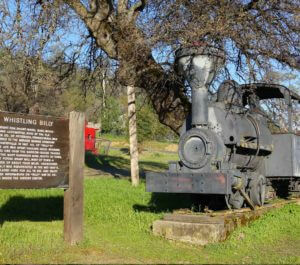 Take the downtown walking tour to see why Coulterville has been named a California State Historical site and drop by the museum filled with old photos and fascinating displays. Sitting at the intersection of state highways 49 and 132, Coulterville is hub to a variety of locations and activities. Five to eight miles west are the recreational areas of Lake McClure and Lake Don Pedro, both meccas for water lovers – fishing, boating, swimming, camping – you name it. Twenty-eight miles south from Coulterville puts you in the town of Mariposa. The Big Oak Flat entrance to Yosemite on Highway 120 is just twenty miles east. And to the north, twenty-two to twenty-five miles, are Jamestown, Sonora, and Columbia. For Yosemite travelers, Highway 132 provides a scenic, laid back alternative to the caravans of RVs, trailers and lead-footed drivers that can make Highway 120 a frustrating journey. East of Modesto the road follows the Tuolumne River through rolling hills and picturesque cliffs to LaGrange. Between LaGrange and Coulterville it passes the southern end of Lake Don Pedro and the northern end of Lake McClure. After Coulterville the road, officially designated at the Historic John Muir Route, climbs towards Greeley Hill, offering impressive vistas both back, over the Central Valley, and ahead, of Sierra peaks yet to come. From Greeley Hill, where you can pause at several cafes, fill up your gas tank or stock up at the store, the shortest route turns north on Smith Ranch Road (well marked for Yosemite), joining Route 120 at Smith Ranch. The slightly more adventurous can continue east on Greeley Hill Road, the original Coulterville – Yosemite turnpike, built in the 1870’s when Coulterville competed against a group working on the old Big Oak Flat road through Groveland (later to become Highway 120) to complete the first road into Yosemite Valley. Three miles past Smith Ranch Road is a well marked left turn on a Forest Service Road, S20, to Highway 120 at Buck Meadows, six miles distant. The last four miles of this route become a gravel road, but very well graded and easily drivable by any car, except during winter snow season.